Sunday Riley Auto Correct Reviews: Does It Work? Sunday Riley Auto Correct refers to a product that is meant to lift and de-puff the area around your eyes. It has been formulated for dry, combination, normal and sensitive skin types. It is intended to reduce the appearance of fine lines and dark circles beneath your eyes. It is meant to combat puffiness, wrinkles, dark circles and fine lines. It is used to help you realize an improved skin complexion as well as helping you achieve a youthful skin. It is helpful in ensuring that you realize a lifted look and brighter skin. It is used to energize your skin so that your skin look lively and it is responsible in clearing the crow’s feet for a better looking skin and it is known to be sold through online. It is a product that has been manufactured by Sunday Riley. The manufacturer claims that this product has been formulated using ingredients that work well so that you can achieve desired results. It is known to be the company’s 1st eye specific product that works well for satisfied results. It is meant to deal with skin’s concerns on the delicate area around your eyes for an improved look. It is a product that is well known to be thick yet, not sticky. It is also meant to help in tightening your skin to give you a youthful look. It is claimed to work well to help reduce wrinkles other aging symptoms instantly. The product targets the symptoms of a tired skin for you to realize a smooth and youthful skin. If you would like to purchase this product, then it is available for Cyber Monday. Brazilian Ginseng Root– It is responsible in tightening your skin for a youthful look. Watermelon Extract– It is used to hydrate your skin to make sure that it is supple and soft. Lutein– It is an antioxidant which has been extracted from marigolds. It is meant to reduce the damage caused by free radicals and ensure that you peepers appear alert, tight and bright. Sunday Riley Auto Correct Review- Does it Really Work? Yes. The product works well to combat dark circles, fine lines, crow’s feet and wrinkles on the area around your eyes for an improved skin’s complexion. It is meant to help reduce appearance of wrinkles and fine lines for a smooth skin. It is responsible in clearing the dark circles below you eyes for a better look. It is used to hydrate your skin making it look supple and soft. There is less discussion on the ingredients contained in this formula. There are no stepwise instructions, which have been provided on how you should use this product. Precautions which are linked to this product have not been listed or discussed in the website. The manufacturer has not indicated the exact time period for you to use the product. 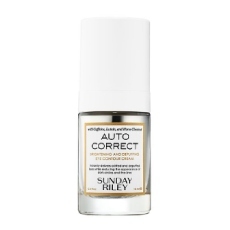 Sunday Riley Auto Correct refers to a skincare product that helps you achieve a better looking skin. It is claimed to help clear crow’s feet, wrinkles and fine lines around your eyes for you to achieve a brighter skin complexion. It is meant to hydrate your skin for you to keep a soft and supple looking skin throughout the day. It is well known to utilize the capabilities of its ingredients to deliver the desired results. On the other hand, if you wish to use this particular skincare product due to the above discussed benefits, then you are required to research thoroughly on its ingredients. Find out the exact dosages of these ingredients, their working and possible side effects they may cause on your skin. Therefore, this is an important step that will help you make prudent decision and find out if the product is safe and suitable for your needs before you purchase it.